Strategy: Search Engine Optimization, Pay Per Click Management, Social Media Optimization. Dr Niraj L Vora is one of the top 5 joint replacement surgeons in Mumbai and Specialist in Total Replacement and Trauma Surgery. Dr Niraj Vora provides his dedicated services as an orthopaedic surgeon at Bellevue Multispecialty Hospital, S.L.Raheja Hospital and Sunridges Specialty Hospital in Mumbai. He approached Samskriti Business Solutions to make his services get global recognition leveraging with good and positive image via various online mode of marketing mix. Increasing web traffic, enhance positive brand awareness, improve ranking positions and service expansion for Dr Niraj Vora. "Samskriti Business Solutions has been a great help in maximizing my ability to reach out to my patients. I could achieve great results through their high integrity services." 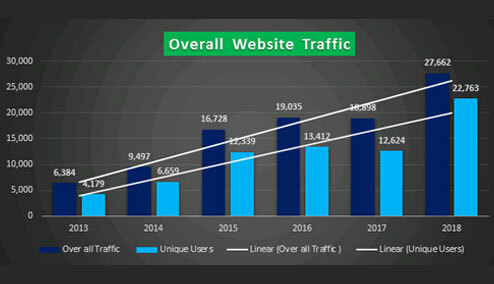 Over the period, since January 2012, we have generated 200% increase in the volume of traffic from different sources through our online marketing efforts. We have generated quality leads through all mediums of direct, organic, social and referral channels. We have created a positive brand image for Dr Niraj Vora in the online arena leveraging all online mediums. We have achieved more than 200+ keywords in the top 3 pages of SERP’s for targeted keyword variants. We have achieved a good set of branded keywords on top positions of Google Local Listings. We are able to top on both sponsored and organic search results for the specific set of keywords. Using Web marketing as the more focused and result-oriented medium, we have driven expected ROI, brand awareness / visibility, positive reputation for Dr Niraj Vora.